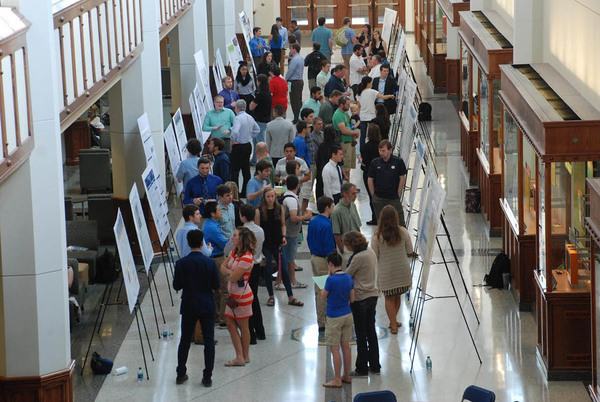 Students from these programs, as well as from Biological Sciences, ND International, Physics, and Turbomachinery Laboratory also took part in a series of social and professional development activities that spanned the entire summer. Who said summer research had to be all work and no play?! Starting with their first week on campus, students enjoyed speed-friending, ice skating, stargazing, and a DVT show and pizza party, allowing them to network and find common interests with students in other programs. They also attended seminars to help prepare them for the research symposium, such as using library resources (by Willie Baer), creating effective posters (by Marya Lieberman), and preparing a 3-minute research pitch (by Erik Simon). Other talks included topics on advanced wireless capabilities (by Nick Laneman), whether or not to attend graduate school (by Greg Snider), and making the best out of your summer research experience (by David Balkin). Some students even participated in an Outreach Science Day for K-12 with the Robinson Community Learning Center. View the full list of 2018 summer events here: Summer Programs Poster. Overall, as you can see, it was a very productive and fun summer for students at Notre Dame! A huge THANK YOU from the REU/Fellowship program coordinators to the seminar speakers and everyone who contributed to the success of this year’s summer activities! We look forward to doing it again next year!! The REU/Fellowship program coordinators are Toni Barstis (St. Mary’s College), Linda Chism (Graduate School), Heidi Deethardt (NDnano), Lori Fuson (Physics), Laura Kresnak (CRC), Amber Li and Lisa Shroyer (NDI), Marya Lieberman (Analytical Chemistry), Cassidy O’Block (Turbomachinery Laboratory), Tiffanie Sammons (Wireless Institute), Barbara Villarosa (ND Energy), and Michelle Whaley (Biological Sciences). For more information, contact Barbara Villarosa at bvillaro@nd.edu, visit ND Energy’s Summer Research page, or contact the REU/Fellowship program coordinators. Originally published by Barbara Villarosa at energy.nd.edu on July 22, 2018.